Last week the electrical inspection passed! We are now able to move forward with the project. The brick mason has been busy working weekends and is nearing completion. Nathan put OSB on a wall so the church can put up a special accent wall. Nathan also worked on getting some foam insulation sprayed in addition to putting up some blocking in the attic for insulating. The timeline for this week includes drywall delivery Tuesday morning. 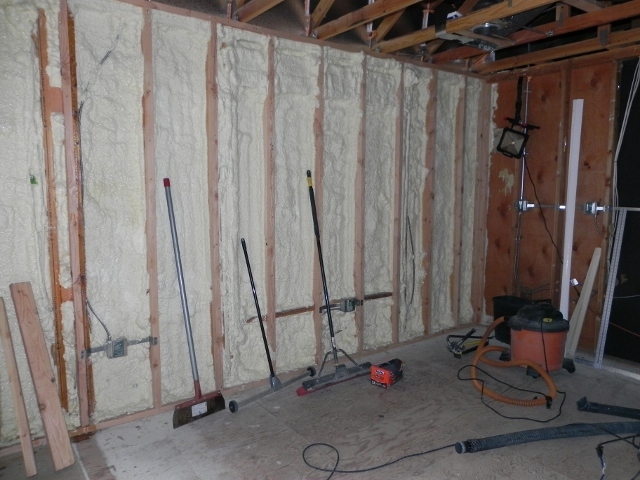 The insulator will arrive Wednesday and drywall will start being hung Wednesday evening. After several months of very slow progress, it has been exciting to see some real steps forward. The past two week have been filled with various projects at Crossroads. Last week Nathan removed windows that are no longer going to be necessary and replaced or put in new windows where they were needed. In the picture above, a new window has been put in. This replaced sliding glass doors that were previously there. A brick mason has been working Saturdays to get the brick ready to replace. 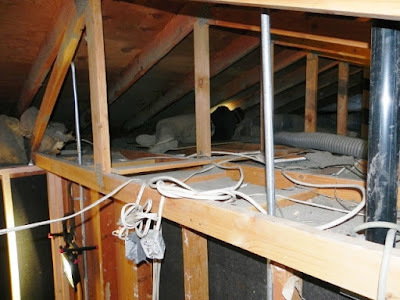 This week, all of the insulation in the attic was vacuumed out. Nathan and a church member spent two days working on this tedious, dirty job. 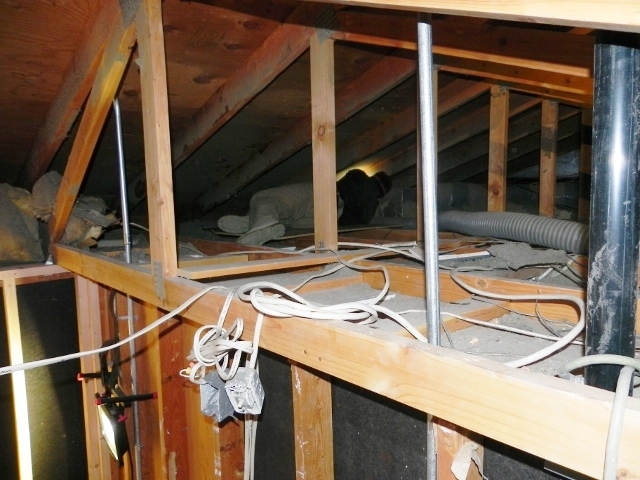 Taking pictures of work in the attic is a challenge but if you look at the back of the picture, you can see Josiah vacuuming in a difficult area. 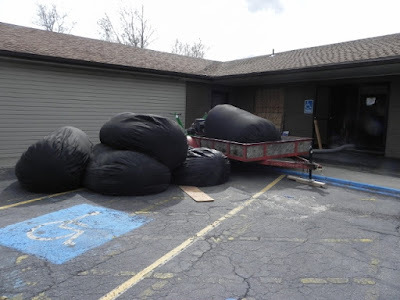 Here is a picture of the bags filled with insulation. There were these five at the end of the first day. By the end of the project, there were eight bags full. 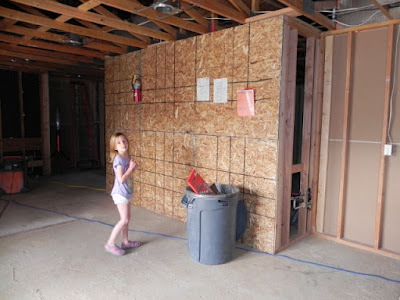 There has been plenty progress on the building remodel at Crossroads in the past two weeks. He finished the drywall and painted the ceilings. Church members will paint the rooms and then we will trim them. Here is one of the classrooms that is now being used since it has been cleaned up since the picture was taken. It still lacks a door as the door we had did not have all the parts for it. Wednesday saw the first day of demolition on a major part of the building. Here is a picture of why the work is necessary. This is the hall leading from the sanctuary to the rest of the building. If it looks small in this picture, there is a good reason. It is. One person had to stand aside to let another person pass.The graffiti on the wall is Nathan’s artwork. He is letting the demolition crew know what stays and what goes. The two pictures above show what is going to be demolished. On Wednesday night and Thursday night, a one man demolition crew came in and was able to get the majority of the walls torn out. This is a shot of after he was finished. It was taken in the same location as the picture right above it. Major change huh? On Saturday and again on Wednesday afternoon, crews from the church came to clean up and to remove more the drywall, carpet, and other things from the area. Much was accomplished. WARNING: Picture quality is low due to darkness and dust. Nine people worked to get this section of carpet up. We are now close to being able to frame in new walls for the bathrooms. BONUS: Just for fun, we included this picture of old wallpaper that we found behind some drywall in the office. Isn’t it great! 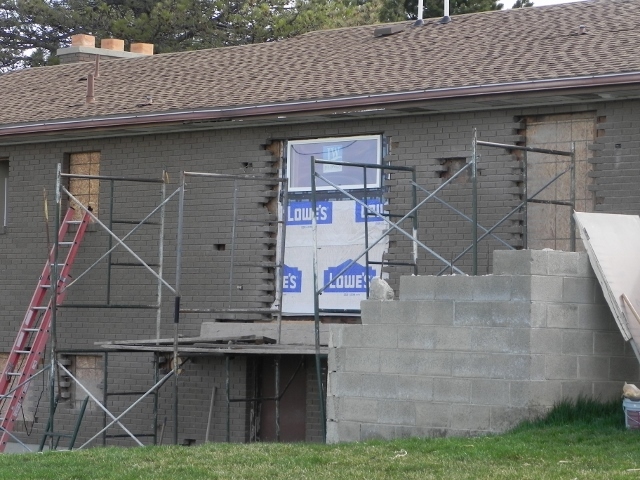 Last week, we went to St. Regis, Montana to work on replacing the basement windows in New Day Fellowship. The window were old and were not well insulated and they leaked. We needed to get the windows replaced before snow set in for the winter or it would not get done until late spring. The old windows were covered with plastic to keep some of the cold out. Here is a look at the same windows from the outside. Two windows on the west side of the basement. Here is a look at the windows without the plastic and with the trim removed. The new windows are in but not yet trimmed. This window over the kitchen sink was both a challenge to get the old framing out and the new framing in. We had to work around the electrical box, conduit, and switch. The new windows look great and let in so much light. We worked in St. Regis Tuesday through Saturday morning. It rained until Friday at noon or about the time we finished with all the outdoor work. But the windows are complete and the church can now enjoy warm fellowship this winter without concerns about leaking, cold windows. We were blessed to attend the Wednesday night meal and meet a few of the church members. They have such a heart to reach their lost area with the gospel. We pray that they will do just that. Last week was Rodeo Bible Camp in Big Piney, Wyoming. This was our first year there feeding the camp. The camp ran from Monday night through the rodeo Friday night. There were 11 girls and 3 boys that ranged in age from 11 to 17. The camp ran the same as the one in Downey with event clinics, chapel twice a day, meals, games, and plenty of fun and building relationships. The kids really enjoyed the week and we were so blessed to be a part of it. This young man getting some valuable help on rough stock riding. Theses girls were learning to rope or improving their skills. This young lady is learning pole bending. During chapel, one of the musicians promised that she would teach any kid to play the spoons who was willing. Every kid came up and did it. Here those with the spoons are learning how to hold them. Here camp pastor (and cowboy church pastor) David (left) and Dennis help out in the arena. The kids worked hard for the ultimate rodeo prize- a Montana Silversmith belt buckle. They were not judged on just rodeo results, but also for their participation in chapel and during devotions. This is the reason we do all this work. These 14 kids stole our hearts and they needed to hear of the love of Jesus. While we all had fun, Faith may have had the most fun. Although this picture is blurry, we had to include it to show the big smile on her face. She loved being on the horse. She also got to drive a golf cart. We won’t comment on her driving skills though. Big Piney, Wyoming sits in the desert with no pine trees in sight. It was named for the creek that runs through that apparently has pine trees on it somewhere, just nowhere near Big Piney. The camp is actually not held in Big Piney but just north of Marbleton, which is just north of Big Piney. This week was a big week in the ministry of Outdoor Life Ministries in Bonner, Montana. West Conroe Baptist Church from Texas came again to assist with Adventure Camp, various construction projects, and random acts of kindness. The adventure camp ran from the Monday through Thursday and featured stations such as Bible, recreation, snacks and games, missions, crafts, music, and adventure. Wednesday was water day and probably the favorite day for many of the kids although they enjoyed the entire week greatly. Five kids made decisions to follow Jesus as their Savior! Construction projects happened in Bonner and Clinton, a town approximately 10 miles east of Bonner. Windows were replaced, roofs repaired, fences put in among other projects. We were also able to put windows in the Lion’s Barn where Outdoor Life Ministries meets for Sunday services. Random acts of kindness included lawn work, passing out Popsicles and water, and assisting at the Teen Challenge thrift store. The week culminated with the Family Fun Night on Thursday with a free BBQ, bounce houses, snow cones, slip and slide, launching of bottles made during Adventure Camp, music, and a message from Pastor Ken. Outdoor Life Ministries was intentional about building relationships with visitors during this time.The event seen over 200 people coming. We had the great problem of scrambling for more tables and chairs as the people kept coming. It was the best event yet in the four years we have been doing this event. The Lord is doing a great work in Bonner and we were grateful to be a part of it. Kids were taught to track an animal that had been shot by following the trail of “blood”. Intently painting a birdhouse in crafts. The ice cream showed up on Thursday and donated ice cream for the kids. Water day included a water obstacle course and water games in recreation. The highlight was the fire department showing up. While we were in Roy, we were able to work on three churches/ministries. 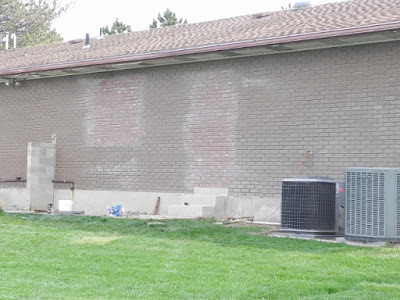 The first was patching a roof over a Hispanic church in Salt Lake. The church has a rather unusual roof as you can see. The patch job will work for now but the church will need to replace the roof in the very near future. Please pray that the Lord will provide the funds needed for this project. The second project was at the Baptist Concern Center, a food pantry ministry in Salt Lake. The last project was fixing a plumbing issue with the baptistry at Good Shepherd Fellowship in Bountiful. Nathan and Amber serve as NAMB Mission Service Corps (Legacy) Missionaries with the Utah Idaho Southern Baptist Convention. Nathan has been serving in the convention since 2000. Amber and Kelly joined him in 2006 after Nathan and Amber were married. We serve as volunteer mobilizers encouraging people to serve in mission projects. We also assist in service projects for church plants and evangelism. We have had the privilege of serving churches, church plants, camps, pastors, and missionaries in Idaho, Utah, Montana, California, Arizona, and Colorado. Our oldest daughter Kelly attends Weber State University in Ogden, UT where she is majoring in communications. Faith is 7 years old and in the third grade. We live year round in an RV and Amber home schools Faith which allows us to continue the ministry where God leads us. God has truly blessed us and we are truly humbled to be able to serve Him.